Villa Redo started his history 300 years ago. And now oldest building on the property, its a part of historical treasury of the island of Ibiza. 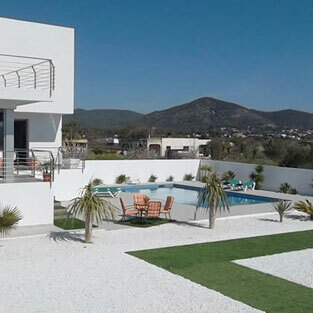 Completely refurbished in 2013 Villa Redo located in the best area of Ibiza. – 12 minutes from the international Airport. 5 minutes from the best beaches like Blue Marlin. 15 minutes from the port. 5 from San Josep. – Possibility to land with a helicopter. – Lounge area( underfloor heating). Bar. Professional musical equipment 700 watt. – Gym all the new generation machine from Technogym. Amazing view on the sea and Formentera island. – Big park with more than 100 different types of plants. Contemporary interior Decor by Philippe Starck, Ron Arad, Kartel, B&B. Some important works of contemporary arts are present. Electricity is automated by BITICINO ( Domotic) Led is to be found everywhere. Electricity spot 45 KVA. Water treated and high pressure. Drinking water. The property is surrounded by 1km of concrete wall and the building is alarmed.